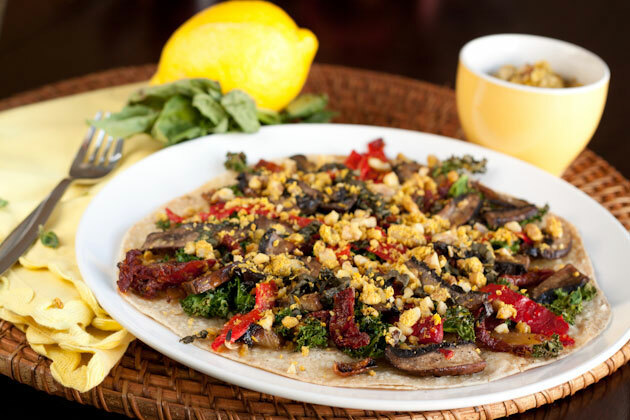 Fresh organic portabella, caramelized onion, greens, sundried tomatoes, walnut “cheese”, drizzled with olive oil & topped with fresh basil, on a brown rice tortilla. To make the walnut “cheese”: combine all ingredients in a small bowl and set aside. To caramelize the onions: heat olive and coconut oils in a large frying pan on medium heat. Add sliced onions and lay flat along the pan. Allow to cook for 10 minutes. Sprinkle with Himalayan salt and coconut sugar, stir to combine and lay flat again. The less often you stir, the better. Reduce heat to medium low and cook for 20 minutes. Once complete, remove onions from pan and leave remaining oil. Preheat oven to 350F and drizzle olive oil on a cookie sheet or pizza pan. To prepare the rest of the toppings: place sliced portabella in the onion frying pan and cook on medium heat for 5 minutes. 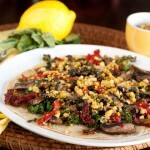 Top tortilla with prepared mushrooms, kale, red pepper, sun dried tomatoes and basil leaves [in that order]. Top with walnut “cheese”, extra olive oil and salt n’ pepper! Bake for 10-12 minutes, before tortilla is browned. Remove from the oven and serve!